From *susmō < *sups(e)mō, from sub- +‎ emō (“to buy, take”), (with excrescent p in sūmpsī かつ sūmptum). Sumo (相撲, sumō?) is a competitive full-contact sport where a wrestler (rikishi) attempts to force another wrestler out of a circular ring (dohyō) or to touch the ground with anything other than the soles of the feet. The sport originated in Japan, the only country where it is practiced professionally. It is generally considered to be a gendai budō (a modern Japanese martial art), though this definition is incorrect as the sport has a history spanning many centuries. Many ancient traditions have been preserved in sumo, and even today the sport includes many ritual elements, such as the use of salt purification, from the days when sumo was used in the Shinto religion. 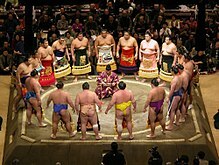 Life as a rikishi is highly regimented, with rules laid down by the Sumo Association. Most sumo wrestlers are required to live in communal "sumo training stables" known in Japanese as heya where all aspects of their daily lives—from meals to their manner of dress—are dictated by strict tradition.